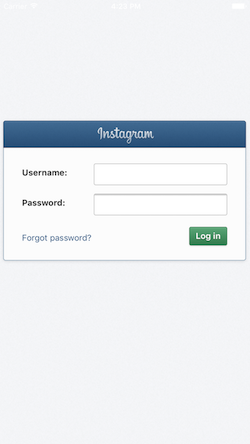 Implement Instagram’s login feature inside your iOS app. This tutorial will introduce you to the Instagram API and teach you how to authenticate an Instagram account and retrieve the ACCESS_TOKEN required for accessing the other endpoints such as fetching media, likes, comments, relationships, etc. This whole tutorial is done from scratch, and no 3rd party library has been used. 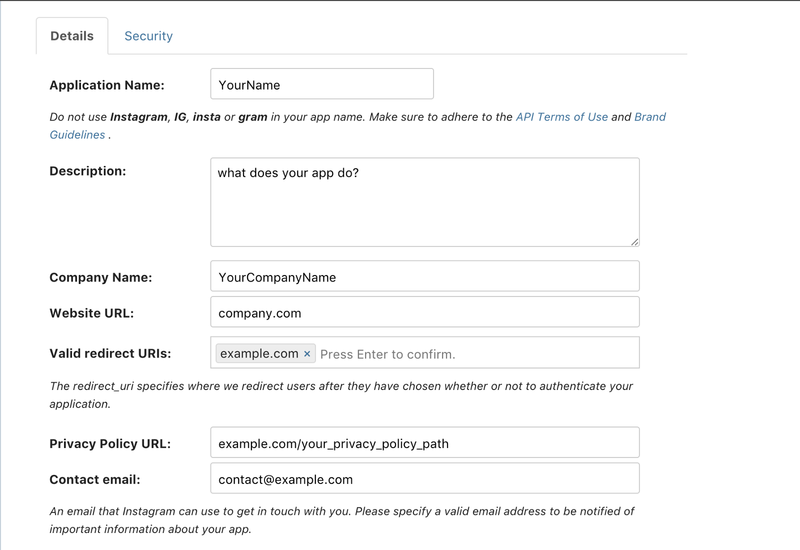 1In order to use the API, we need to register an application on the Instagram API Platform and receive a CLIENT ID. The below form shows you how that screen looks like. I have filled it with some dummy details, so please use your own when registering your app. All the fields are mandatory. 2 After you enter all the required details, click on the Security tab right next to the Details tab and uncheck Disable implicit OAuth. It should be checked by default, as shown below. When you are done just click the Register button. 3 If your app was successfully registered you will be redirected to the Manage Clients screen where you can find your Client Info. Instagram defaults your API to Sandbox Mode. That means that you can only use 500 requests per hour per access token. If you want to read more about the limits you can find it under Rate Limits. That limit will be sufficient for testing, but if you want to go live then you need to submit for Production Mode. To do that, Instagram wants you to finish your app, then record a video that shows how you use their API’s, and submit for review. You also need to select which permissions you will need. 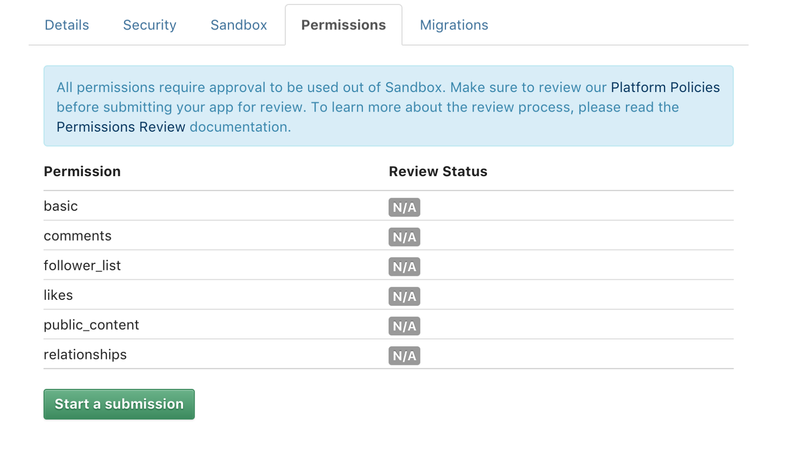 The submission process is similar to the Facebook API. You can find the submission form under Manage -> Permissions. Instagram doesn’t provide us with an app login like Facebook does. Instead, we need to call a specific URL directly into UIWebView which will open the Instagram login form. Then, the user should enter his credentials and our job will be to intercept the response from the callback. This is the only way of implementing Instagram’s authentication. I won’t show you how to add a UIWebView component in the interface builder, as I assume you already know. I will focus only on the code. Please create a separate controller with UIWebView component and an IBOutlet before proceeding further. First of all, we are gonna store the constants under a struct named API. I prefer to keep all the constants under a separate file named Constants.swift. static let INSTAGRAM_REDIRECT_URI = “ENTER_REDIRECT_URI"
Enter the following code inside viewDidLoad() which will call the login form from Instagram. We need to implement the shouldStartLoadWith() UIWebViewDelegate method, where we are going to intercept the access_token. let range: Range<String.Index> = requestURLString.range(of: “#access_token=”)! The checkRequestForCallbackURL() function will check if the URL contains a prefix with your REDIRECT_URI and then retrieve the access_token. I have also created another clean function where you can handle your own logic for the access token. A bunch of techies who educate each other by sharing ideas and experiences that make a difference in our cool nerdy lives.